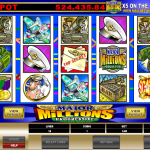 Major Millions is a video slot game that is not only dear to punters but also to its provider, Microgaming. This is one of the first games that the provider needed back then to make a big break in the Online Casino Industry. The game offers exactly what players need, a simple straightforward game play with a possibility of a huge win. The main there revolves around the military so on the reels we can see a fighter plane, major’s cap and a box of ammunition, just to name some. Two special symbols will make a huge difference to your bankroll, the wild and the scatter. The Major Millions logo is the wild and it substitute for every other symbol except the scatter to complete a winning combination. All the wins that the wild takes part in will be a subject to x 3 multiplier. The scatter is a big explosion symbol and it offers scatter payouts only. So, you are probably wondering how we can get a hold of the progressive jackpot. The wild is back again in game here. You need to land 5 wild symbols on the 15th pay line and you will see the current jackpot total transferring from above the reels to your balance. 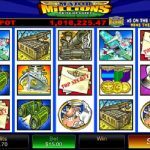 Major Millions has passed the test of times, like many other Microgaming’s game just because it is so generous. Your whole life can change in the nick of time when you play this kind of games. There are no special features here, but who needs them when we have a progressive jackpot to chase. If you haven’t had the chance to play this game then we advise you to do so and you will have no regrets. For a great progressive jackpot slot you should consider playing LotsALoot 5 Reel a 5 reel slot by MicroGaming.